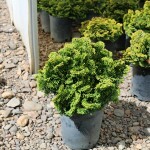 A slow growing, widely conical, compact shrub with bright yellow foliage that matures to green. It will take full sun without burning. It is easily grown in an average well-drained soil. Avoid wet, poorly drained sites. There are some orange tinges to the foliage in winter. It is faster growing than Chamaecyparis o. 'Nana Lutea'.